Rishikesh , a beautiful city Located in the foothills of the Lower Himalayas, in the Tehri-Garhwal region of Uttarakhand, this holy town serves as a starting point for the other religious hubs in the state – Badrinath, Gangotri, Kedarnath and Yamunotri (part of the ‘Char Dham’ pilgrimage route) . also Known as yoga capital of the world. It is famous for yoga and meditation, pilgrimage and also hot destination for rafting and camping. For those who are looking for a break of the spiritual kind, Rishikesh has a host of ashrams and yoga centres, offering lessons in yoga and meditation, besides other spiritual activities. There are many yoga ashrams and all kind of yoga and meditation classes. Rishikesh is situated on the bank of river ganga at the foothills of Himalaya. It is one of the holiest place for hindus that's why many sages and saints and yoga masters have been visiting the city.and it is the yoga teacher training hub across the world. There are many ashram or yoga school which are providing yoga teacher training. Rishikesh is full of spiritual energy because of ganga and the Himalaya. Lush greenery , pure water and fresh air and untouched natural beauty make it more beautiful. 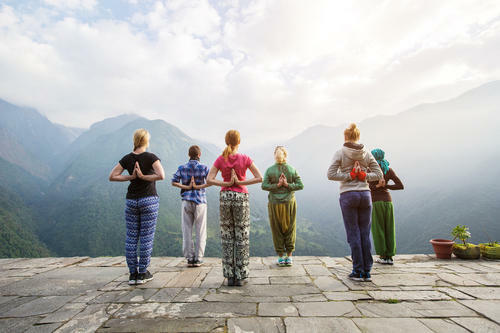 Rishikesh is the home to some of the most reputed yoga school and ashram because of its such a rich rich yoga and spiritual heritage. Rishikesh also attract visitors for rafting and camping and for many adventure activity. Other places to visit here are Ram jhula, parmarth niketan, gita bhawan, triveni ghat, neelkanth temple etc.